Virtual Bookkeeper Services from a professional, honest, dedicated and responsible team of Miami bookkeeping and accounting professionals. Owner and founder of Your Bookkeeping Department, Manal Oliver, has worked in accounting for over 30 years. Since founding her own accounting firm in 1996, Manal has helped people grow their business by using numbers to help them function more productively. She takes great pride in the team she has assembled around her, a talented staff of Miami bookkeepers that enables her to provide her clients with a full complement of bookkeeping services. Her passion for staying at the forefront of technological innovation benefits her clients considerably. 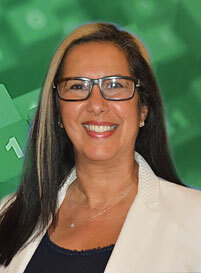 Manal is active in various professional and community organizations, including the National Association of Tax Professionals, American Institute of Professional Bookkeepers, Miami Beach Arts Trust (Board of Directors), Miami Beach Chamber of Commerce, Miami Dade Gay/Lesbian Chamber of Commerce and Miami Beach Design Preservation League (Former board member). Flexible plans meet the needs of a wide variety of small businesses and individuals - whether you need occasional advice, direction, tips and troubleshooting or are looking for a full-service bookkeeping option. With years of experience working for small businesses, we understand most small business owners don't require a full-time bookkeeper, or they work from home and don't want to open their private space to someone maintaining their books. Business owners who do their own bookkeeping often waste time, money and energy better invested in their business or they overspend on an accounting firm to do the work. What makes us better bookkeepers? Our virtual bookkeepers are here year round and have been for years, so you can count on our remote bookkeepers now and in the future. Your accounting data is available 24/7 on a secure network server from your home, office, customers' location, job site - anywhere there is an internet connection. Our virtual bookkeepers listen to what our clients want and need. Then we recommend and develop services that can be of benefit. Our virtual bookkeepers ask the questions that should be asked and know the information that we need in order to help. We have years of experience and stay in sync with our industry's ever changing laws and technology. Our virtual bookkeepers analyze your business, including the type of accounts and most common transactions that occur then provide financial insight into your business. We maintain excellent bookkeeping records that are tailored to your individual business needs. Data entry and bookkeeping is done for you overnight, so your books are always current. Our virtual bookkeepers provide a full range of bookkeeping services to meet your various needs, on your computer or on ours, on-site as well as online. Our virtual bookkeepers talk to you in English or Spanish, depending on your preference, but not in a business and accounting language that cannot be easily understood. Our virtual bookkeepers can provide you with training in business management tools including bookkeeping and payroll service, if desired. Our virtual bookkeepers maintain strict confidentiality and have a comprehensive system to safeguard your information. You have 100% control of daily cash and real time access to expense data.